There are two kinds of people who want to improve their memories, the deeply frustrated and the sceptically curious. How To Develop a Perfect Memory is the ideal manual for both. Reviewing – actively refreshing information as long as it’s needed. My aim (like O’Brien’s) is to get you using each of those tools. And by doing so, to let you see for yourself the incredible impact a few small new habits will have on your life. To make things even easier, you’ll find suggested next-steps, 6 FREE memory-system templates and an appendix of 21 step-by-step guides to make getting started as painless as possible. When you finish here today, you’ll see the world in a different way. Whatever your motive, you’ll see that developing a perfect memory isn’t just about card tricks or memory championships. It’s a skill that will touch and transform every part and every phase of your life. But most of all, you’ll see that developing a perfect memory isn’t a question of age, opportunity or ability. It’s one of patience, persistence and practice. In other words, there are no excuses. You, too, can develop a perfect memory, no matter where, who or how old you are. So, with that firmly in mind, let’s begin. The Journey Method uses familiar places and journeys to create anchors for memories. If memories are like files, the Journey Method is the filing system that makes storing (and finding) them easy. It begins with creating your first mental journeys – fixed routes through pre-set stations of familiar physical spaces. These journeys can be tours of your home, office, church or school. They can be your commute to work, walk to the shops or even a favourite hike. Grab a pen and scrap paper (or open a note taking app). Scan the room you’re in clockwise (left to right). As you do, note any features (laptop, window, bookshelf, door, desk, bin etc…) that catch your eye. When you’re done, close your eyes and picture each stage of your mini-adventure in your head. Repeat step 5 until you’re confident you can visualise all your chosen features in order. Congratulations, you just created your first mental journey! For extra points, close your eyes and work the route backwards. Easy right? If you didn’t play along, ask yourself why you youʼre even reading this summary. Then, if youʼre serious about improving your memory, do the exercise now. Linking uses memorable mental images to anchor memories at stations along mental journeys. Why is it so effective? Because our brain is hardwired to prioritise memories that are (1) visual and (2) emotional and those are exactly the kind of mental images we’re going to create. Clear your mind and look at (or picture) the first station from the mental journey you created above. Repeat with station #2 + character #2, station #3 + character #3 and so on to the end of the list. When you’re done, make a quick sweep of the stations and let the mental images you just formed wash over you (if you notice any weak ones, remake them). Don’t judge yourself for what pops into your head (being human is complicated and nobody else can see what you’re thinking). Surprise and shock are powerful (and thus useful) emotions. Embrace them. Ready? Unleash your inner crazy and work through the exercise above. Now, close your eyes and travel your mini-mental journey once more. As you do so, allow the images you created above to wash over you as you visit each station. The result? I bet you can easily remember the list of characters above. What’s more, I bet you can remember them backwards. Give it a try! The best news? If your mental journey is long and familiar enough and your links powerful enough, this technique is basically limitless. Linking only works well with things we can visualise clearly. Things like places, people and objects. So what can we do about abstract things? Things like names, numbers, playing cards, speeches or foreign vocabulary? Association substitutes abstract ideas (names, numbers, concepts, words) with concrete placeholders (people, locations, objects) we can use in linking. Allow an abstract idea to fill your mind. Follow your chain of thoughts until you hit something concrete and vivid. As with linking, the biggest obstacle to effective association is likely to be yourself. Forget “I can” or “I can’t”, relax your mind and embrace first impressions without judgement. Which reminds me of “To be or not to be”…. Which conjures a picture of Shakespeare’s Hamlet talking to a skull. Which conjures a picture of my Toby in his usual outfit holding a clipboard of names. On meeting a Toby at a party I might picture them talking passionately to a skull in the middle of the room. Or standing at the door charging people for entry. Both images would be memorable enough to recall new-Toby’s name through the night (and, with revision, beyond). Neither image above might work for you but both are vivid enough for me to stand-in for an otherwise abstract concept (in this case, a name). Which raises an important point – if you follow this path, you may be tempted to use other people’s associations for common names, numbers and foreign words. Don’t do it. The strongest images you create are your own. Short-term time and effort making your own associations is always offset by the long-term benefits of personal connection. Grab your pen and paper (or note taking app). Write the first five names that pop into your head. Follow your thoughts till you hit something concrete and vivid. Write your impressions down in a sentence or two next to the name. Call to mind an(other) acquaintance, public figure or celebrity with the same name. Practice linking an image of that person to your ready-made association. Repeat till the end of the list. Relax and have fun. This is an exercise in making goofy connections, not a test. Also, don’t worry if your brain feels rusty, after a few goes you should feel warmed up. The good news? Association is a general skill that gets faster and stronger with practice. What’s more, in time you’ll find patterns in many areas that allow old substitutions to be reused, speeding things up even further. For more context-specific suggestions (names, foreign vocabulary etc…), see the step-by-step guides in the appendix at the end of the summary. Turn single digits (0-9) into objects. The goal is to create a store of ready-made associations that make memorising numbers a breeze. Use these letter pairs as the basis for person plus action (or object) associations. You’ll find the full system (as well as space and tips on creating your own) in the downloadable templates. Don’t panic – you don’t need to memorise this list or these connections (you’ll be building your own in the templates). But with The Journey Method and Linking, I hope you can see how easy it would be to use these mental images to store and recall all 12 digits in just six stages of a pre-prepared mental journey. How? By using complex images. Which is actually easier than it sounds. 70 33 = Godzilla / planting a flag. We can store all 12 digits in just 3 stages of our mental journey. What if there’s an odd number of digits (i.e., a number left over)? Great question. The solution is a backup system (in O’Brien’s case, the Number Shape System) that turns individual digits (1 – 9) into objects. So with a “0” left over, we would simply add a “football” (the object code for “0”) to the fourth station of the journey. Kapeesh? If anything’s not clear (and for the full Number-Shape System) check out the downloadable templates. Still stuck? Leave a comment below and I’ll try to respond. Now, I won’t lie to you. Creating the first version of your own Dominic System will take a few hours. And getting it second nature takes practice. But before long, turning digits into images and back again will become second nature. And being able to do so will instantly and profoundly improve your ability to memorise even the longest of numbers. But it gets even better. Because you can use the Dominic System to memorise appointments, financials, statistics, dates, playing cards, coordinates, chess games and anything else that can be encoded in numbers. In fact, with minor adjustments, you’ll find yourself able to memorise almost anything better and faster than you ever thought possible. That’s why creating your own Dominic System is one of the smallest and yet most powerful investments in your ability to learn that you’ll ever make. It’s the closest thing out there to learned Synesthesia. 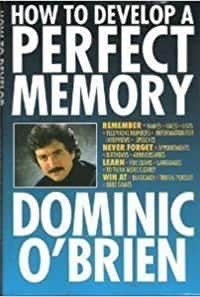 There’s not much on reviewing in How To Develop a Perfect Memory so I’ve supplemented this section with thoughts from another of O’Brien’s excellent books, You Can Have an Amazing Memory. 5 reviews (The Rule of 5) is generally enough to get information into long-term memory. The most important review is the one you make immediately after you finish memorisation. Don’t rush off to something else or attempt to write down answers right away. Be patient, review your journey one more time and rest assured that every minute doing so is a minute well spent. Re-strengthening any images that have weakened along the way. N.B., The tools above work like scaffolding. They support new memories while their foundations are hardening. Over time, though, you should find the information they prop up becomes stable without support, letting you re-purpose your mental journeys as needed. To forget information, stop reviewing it. Or to clean out a mental journey sooner, imagine it totally empty as you walk through it in your mind. Reviewing – keeps everything fresh while its needed, or as long as it takes to reach long-term memory. Because developing a perfect memory doesn’t just happen by chance. Like any skill worth mastering, it takes a growth mindset, hard-work and persistence. More specifically, it takes a good deal of preparation and a great deal of practice. Your own Dominic System – to reify the numbers 00 – 99. With these in place, you’ve broken the back of the system. All it needs from there on is expansion. Send yourself these handy FREE templates to walk you through the process. Set aside 30 minutes a day for the next 7 days to chip away at the task. N.B., Creating these three cornerstones will be taxing. Take your time and space out your efforts over the 10 days. If you try and build Rome in one sitting you’ll both exhaust yourself and do a worse job than with rest between sessions. With your memory systems in hand, you’re ready to check out whichever of the 21 step-by-step guides below that catches your eye. Remember: Improving at anything requires consistent and regular practice. Memory improvement is no exception. If you’re serious about progress, give the 30 minutes you set aside for preparation a permanent place in your calendar. Review – What you don’t review, you will forget. Keep a list of all your mental journeys and be sure to review them as often as needed to keep them (and any information within them) fresh and at your fingertips. Learn – Put your improved memory to use! Take a language or topic you’re already learning and experiment with the skills that you’ve learned. Not learning anything? Now’s a great time to start! Pick a subject, do some research, draw up some lists and get memorising. Expand – It won’t be long before you outgrow your first few mental journeys. Practice time is the perfect opportunity to find, map and perfect new ones. Improving your memory is as addictive as it is rewarding and you’ll quickly find yourself wishing you had more time to spend on it. My advice? Take it easy, don’t let your ambitions overwhelm you and remember: consistent daily practice is the key to compounding progress. If you enjoyed this summary, I can definitely recommend a copy of O’Brien’s How To Develop a Perfect Memory. He’s a fascinating character and this brief overview lacks all of the charm, wit and examples that make the original one of the best books on memory out there. For even more goodness, check out this awesome reading list of Books on Improving Your Memory. In it, I’ve gathered my top 30 book recommendations on memory improvement, split into 8 handy sections from “Memory Techniques” and “Memory Books for Students” to “Books on the History of Memory” and “Memory Themed Novels”. You’ll find plenty of reading there to fascinate, inform and inspire you. Still curious? If you love the idea of developing a perfect memory but still aren’t sure how to get started, head over to my friend Anthony Metivier’s excellent Magnetic Memory Method. His free 4-part video course on designing memory palaces is awesome and a great way to get started on your first mental journey. And lastly, thank you for stopping by and reading this summary today. You too can develop a perfect memory. No matter who or how old you are. And I hope that what you’ve read here today has inspired you to embark on that journey. Good luck, good memorising and go well! The following section contains step-by-step guides for improving memory in a number of practical ways. If a term or process doesn’t make sense, head back to the tools section above or leave a comment below and I’ll jump in and help. For next-steps you can action today bookmark this page, head back to the conclusion, complete the downloadable templates then come back here with your basic memory systems in place. Bring to mind your mental journey. Run through an empty version of the journey to refresh and clear it. Visualise the first station on your journey. Visualise the first item on your list (use association if necessary). Link the first item to the first station of the journey. Repeat with the next station and item until finished. Review your journey immediately, strengthening links as needed. Decide to remember people’s names and focus during introductions. Face: Study the person’s face. Location: Visualise a typical place (any place, not a mental journey) associated with this likeness. Name: Use association to encode this person’s name into a mental image. Memory: Use linking to combine this mental image with the visualised location. Review your images as soon after introductions as possible. Likeness: Complete the sentence, “This person looks like a typical [e.g., bank manager]”. Location: Visualise a typical place associated with this occupation. Location: Pick a feature of the room you’re in now as the context for your linking. If you get the name before you see the face, reverse the order (Name, Location, Face) using the name to set the context for location. If a person’s name has a very obvious connection to their appearance (e.g., Mr Bushy + a moustache), use that connection. Use association to visualise the first name on your list. Link the first name to the first station of the journey. Repeat with the next station and name until finished. Bring to mind a journey of appropriate length. EITHER: a simple image from the first two digits (one digit pair). OR: a complex image for the first four digits (two digit pairs). Link the image to the first station of the journey. Repeat with the next station and digit group. Use The Number Shape System to visualise and link it to the next station. N.B., To remember binary sequences simply convert 3 or 6 binary digit groups into their respective numerals or digit pairs. You’ll find a handy 64-bit cheat sheet for these in the downloadable templates. N.B., I wouldn’t typically recommend remembering things that can be easily managed by a good productivity system. That said, O’Brien makes a good point that any opportunity to practice association and linking is good practice for memory in general. Bring to mind the first of your 31-stage mental journeys. Use association to visualise events in the upcoming month. Link each event to the stage of the journey corresponding to its date. Repeat for next month’s events with the second journey. Review your journeys immediately, strengthening links as needed. Review your journeys from a bird’s eye view each morning (hence the outdoor setting) for an overview of what’s ahead. Add or remove events to the journeys (or information to events) as needed over time. At the end of the month, clear and re-use the current month’s journey for events in 2(/3) month’s time. Bring to mind your 10-stage mental journey. Use association to visualise the first event on your list. Use The Dominic System + dd/mm (or mm/dd) to add date information to the event. Link the event to the first empty station of the journey (it doesn’t matter if not in date order). Review your journey each morning moving events into one of your 31-stage journeys if applicable. Add or remove events to the journey (or information to events) as needed over time. Use association to visualise the first chore on your list. Link the first chore to the first station of the journey. Structure the all information you’ll need into topics and bullet points. For each topic, prepare a mental journey whose context relates to the content of the topic. For each bullet, use Association to create vivid mental images that encode the ideas it contains. Use The Journey Method and Linking to store those images at stages of the topic’s mental journey. Review your journeys and images until you feel confident navigating the information you’ve stored. Visit and retrieve information as required from your mental journeys during the interview. Structure your speech as an ordered list of points and facts you can talk around. For each point and fact, use Association to create vivid mental images that encode the ideas it contains. Use The Journey Method and Linking to store those images at stages of the speech’s mental journey. Review your journey and images until you feel confident navigating the information you’ve stored. Give the speech by talking to your points as you follow the journey in your mind. Bring to mind your empty, direction-dedicated journey. Use The Journey Method, Association and Linking to store directions at each stage of the journey. Follow the directions as you follow and decode the journey in your mind. N.B., O’Brien uses an ingenious system of encoding directions in golf games as his way to memorise long lists of directions. For those who enjoy golf, see the original book for more. For the rest of us, a standard journey and associations for common “direction terms” is probably the best bet for now. O’Brien dedicates 10 pages to a system that lets you calculate the day of the week on any given date in the 20th Century calendar. I’ve neither the interest nor the patience to replicate that here. If it’s something you’re interested in, try this great article by Josh Cohen over at Art of Memory! N.B., Not only is this very enjoyable and therapeutic, it’s also a great way to use your past as an almost limitless source of new mental journeys. Sit or lie comfortably in your quiet place and close your eyes. Imagine yourself transported to a specific physical location from your past. As you do so, let sensations and emotions wash over you as they come to mind. Be patient and enjoy yourself – allow memories to come and go. When you feel ready, move on to the next place or location. 1 x memory town/city (a place you are familiar with) per language. Use association to let the phonetic sound of a foreign word suggest a key image to you. Picture a location in town that makes sense based on that word’s meaning. Use association and linking to combine the key image, meaning and location. Gender – Split your city into gender districts and place e.g., feminine or masculine restaurant words in locations accordingly. Extra Locations – It’s ok to combine real locations with imaginary ones. If no sports complex exists, make it up and put it somewhere! Image = Bank Teller counting out plates in a restaurant in the masculine part of town. Use association to visualise the central fact (e.g., name of a thing, person, place or event). Use association (or The Dominic System if appropriate) to visualise the secondary fact. Visualise a location relevant to the fact, topic or associated country. Use linking to combine your images somewhere in the visualised location. As for remembering lists but try to use a journey with the right number of stations in a loop. E.g., For the countries of South America, your journey would have 13 stations with the 13th connecting back to the 1st. Appropriate mental journeys or locations relevant to the facts to be remembered. As for remembering lists but try to use a journey that’s set somewhere relevant to the list of dates in question (or at least the first date on the list). Use The Dominic System to visualise the date for that fact. This excellent Wikipedia article has everything O’Brien has to say on acronym mnemonics and more. Bring to mind your first, empty, playing-card-dedicated journey. Repeat the process for as many additional journeys as you’ll need. Visualise the first station of the first journey. EITHER: a simple image from the first card called. OR: a complex image for the first two cards called. Repeat for each station until your first mental journey is full. Repeat, filling as many back-to-back mental journeys as needed. N.B., this is the exact strategy that O’Brien used to set several world records for remembering playing cards. Use association to visualise the question. Use association (or The Dominic System if appropriate) to visualise the answer. Visualise a location relevant to the fact or topic. Bring to mind your chosen mental journey. Visualise the first fact on your list (use association if necessary). Visualise any extra information to add to the fact (again using association). Link any images containing extra information to your original mental image. Link the final mental image to the first station of the journey. A checklist that breaks down the many components of good technique. An appropriate mental journey relevant to golf (or your sport of choice). Visualise the first point on your checklist (use association as necessary). Link that mental image to the first station of the journey. Repeat with the next station and checklist item until finished. Review your checklist to set focused practice goals and objectives. N.B., for some great tips on perfecting purposeful practice, check out this summary of Daniel Coyle’s Little Book of Talent. 1 x Appropriate mental journey for each chess sequence or game to be remembered. Visualise the origin of the first move by encoding its algebraic notation with The Dominic System. Visualise the piece to be moved with your Chess Piece System. Combine the two mental images using linking. Link that final mental image to the first station of the journey. Repeat steps 4 – 6 with the destination of the first move. Link that final mental image to the second station of the journey. Repeat the process for as many moves as required. O’Brien’s account of his experiences beating casinos at blackjack is more entertaining than practical. Use this information to adjust his bets (by memorising reams of statistical tables). The result was a slight edge over the casino which lasted as long as it took for him not to get banned. The general consensus today is that the conditions and anonymity O’Brien enjoyed to beat the bank (even with his clever system) have been mostly eliminated. Partly by changes to casino rules but mostly by technology that makes it possible to catch and ban card counters quickly as well as globally. That said, the story is still an entertaining, impressive and practical demonstration of how a perfect memory can be used for personal gain. As above. A good story but mostly redundant in today’s always-connected world. O’Brien’s technique relies on outdated quiz systems with only a limited bank of (e.g., ~1000) questions. By buying a second-hand system and learning its entire repertoire, dedicated Brits could turn small profits touring the pubs and bars of back country England. These days, you’d be hard pressed to find a quiz machine with a question bank exhaustible by even the most dedicated of students. OOOOOOOH!!!!! Excited to do the exercises. I’ll be happy to share my experiences as I do the exercises. Super! Looking forward to hearing your progress, Emmeline. Creating and learning my own Dominic system is easily one of the best things I’ve ever done when it comes to learning faster. And combining it with memory journeys is game-changing. Good luck!